In the seven seasons they played together for the Cardinals, Bob Forsch and Ted Simmons formed a special bond. Forsch pitched 12 shutouts during that time, including his first big-league win and a no-hitter, and Simmons was the catcher for each of those dozen gems. 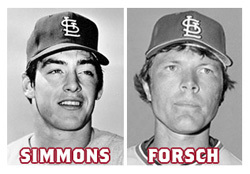 Forsch, Simmons, outfielder Curt Flood and instructor George Kissell are being inducted into the St. Louis Cardinals Hall of Fame on Aug. 15, 2015. When Forsch debuted with the Cardinals on July 7, 1974, in the first game of a doubleheader against the Reds at Cincinnati, Tim McCarver was the catcher and Simmons played first base. After that, Simmons caught the majority of Forsch’s games while they were Cardinals teammates from 1974-80. Simmons caught more of Forsch’s games than any other catcher during the pitcher’s 16 seasons in the major leagues. Forsch pitched in 498 regular-season games. Simmons was his catcher in 181 of those (or 36 percent), according to baseball-reference.com. Simmons, who led the Cardinals in RBI for seven consecutive seasons (1972-78), helped Forsch develop into a Cardinals ace. Forsch had a career ERA of 3.76. In games caught by Simmons, Forsch’s ERA was 3.43. Opponents had a career batting average against Forsch of .261. In games caught by Simmons, foes hit .254 versus Forsch. Selected by the Cardinals as a third baseman in the 26th round of the 1968 draft, Forsch ranks second on the Cardinals career pitching list in games started (401), third in wins (163), third in innings (2,658.2) and fifth in strikeouts (1,079). In his second appearance with the Cardinals _ and his first with Simmons as his catcher _ Forsch pitched a four-hit shutout against the Braves for his first win in the major leagues. Forsch limited the Braves to four singles in the second game of a doubleheader at St. Louis on July 12, 1974. He also singled off Lew Krausse for his first big-league hit. Simmons was 1-for-3 with a run scored. He also walked and was hit by a pitch. The Cardinals supported Forsch with a nine-run first inning and won, 10-0. Forsch yielded a leadoff single to Bud Harrelson, then didn’t give up another hit until the fifth. He pitched a four-hitter in a 3-0 Cardinals victory against the Mets on Sept. 6, 1974, at St. Louis. In the Cardinals’ second game of the season, Forsch pitched a two-hitter in a 4-0 victory over the Expos at St. Louis on April 9, 1975. The Expos were limited to singles by Tony Scott and Barry Foote. Cesar Cedeno singled in the first, Larry Dierker singled in the third and the Astros were held hitless by Forsch for the rest of the game. Forsch pitched a two-hitter in a 6-0 Cardinals victory at Houston on June 6, 1975. In a game delayed by rain for more than two hours at the start, Forsch retired the first 10 Cubs batters in a row before Rick Monday doubled with one out in the fourth. Forsch pitched a four-hitter in a 4-0 triumph on Aug. 2, 1975, at Chicago. In his last start of the season, Forsch pitched a three-hitter in a 1-0 victory over the Pirates on Sept. 26, 1975, at St. Louis. Simmons drove in the run with a RBI-single off Jim Rooker in the first, scoring Lou Brock. Forsch pitched a three-hitter in a 4-0 Cardinals victory over the Astros at St. Louis on July 21, 1977. Jose Cruz, Forsch’s former teammate, had two of the hits. Enos Cabell had the other. After yielding a single to Bruce Boisclair in the first inning, Forsch gave up one other hit _ a Lenny Randle single in the sixth _ in pitching a two-hitter against the Mets on Aug. 17, 1977, at St. Louis. Forsch pitched the first of his two no-hitters, beating the Phillies, 5-0, on April 16, 1978, at St. Louis. In the ninth, Forsch retired Jay Johnstone, Bake McBride and Larry Bowa on groundouts. In his third start after the no-hitter, Forsch pitched a five-hitter in a 9-0 Cardinals victory over the Giants on May 2, 1978, at St. Louis. Simmons and Forsch each had a RBI. Simmons broke a scoreless tie in the seventh with a home run off Burt Hooton and Forsch pitched a three-hitter in a 2-0 Cardinals victory over the Dodgers on May 11, 1978, at Los Angeles. Forsch held the Phillies to three singles _ including one by their 37-year-old catcher, McCarver _ in a 5-0 Cardinals victory on July 27, 1979, at Philadelphia. Pete Rose and Mike Schmidt were a combined 0-for-6 with a walk against Forsch.